Sorry, this show is over. In an age where children’s imaginations seem to only get filled with high tech animated characters, things that shoot or explode, and dead things coming to life in the grossest way, this year’s show presents a more traditional fantasy. These childhood fantasies are presented at pace with music and lighting effects to enhance them, and all through the challenge of “The Game”. As we meander or leap through our imaginations we visit Mythological Lands, An Enchanted Forest, and A Swamp full of Fairy Tale & Nursery Rhyme characters, not to mention getting involved in a Wizards Challenge. Just when we think it is safe to wake, the Pharaohs have their revenge. This fun-filled show for the whole family will have you in stitches one minute, and with tears of joy the next. Brought to you by Scouts and Guides from across Auckland, this is a slice of wholesome family fun with songs you know and some you don’t. Dance, comedy and youthful delight, brings this all together in a family experience not to be missed. 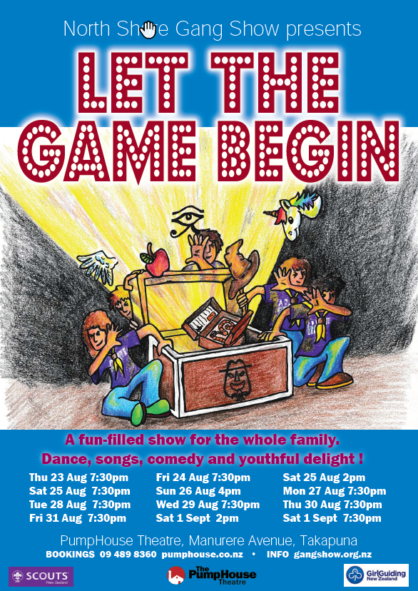 Directed by Steve Hurley, North Shore Gang Show continues its proud history of presenting quality family entertainment, whilst showcasing the talents of the young people in the Scout and Guide organisations. In the 2016 season, this bi-annual show had several sell out performances, so book early to ensure your seat – this is a show not to be missed!